Everyone gives plenty of thought to the importance of spring cleaning the inside of their home but what about the outside? Kenosha seasonal yard cleanups are a vital part of taking care of the look of the outside of your house but there is more to it than that. What most homeowners do not realize is that there is a great deal of importance for taking care of this yard cleanup aside from just the overall look. The main benefit you actually gain from professional yard cleanups in Kenosha is that this prevents the buildup of debris and organic matter which can form a blanket. This blanket acts as a barrier between your grass the sunlight. It can also end up blocking out water, oxygen and other crucial nutrients. So when that matter is left untouched it begins to cause harm to your lawn. Once spring comes around your grass and spring time blooms may not even be able to grow or recover. The problem is that many homeowners assume this material will break down on its own. While chopped up into a type of organic mulch this can sometimes be beneficial to plant life, left on top to cover it only smothers your grass, flowers and other desirable plants. 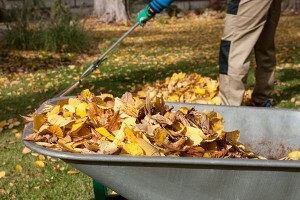 We all know what a hassle raking leaves can be in the fall. As soon as you do it once, you turn around and it needs to be completed again. What often happens is homeowners simply leave the rest of the autumn foliage on the ground. What this does is become the perfect growing and breeding ground for mold. So by the time spring rolls around your yard is not only lacking the nutrients needed to be healthy, it is now subject to health problems related to mold exposure and overgrowth. There is no reason to actually feel overwhelmed with this task when all you have to do is let professional Kenosha landscapers take care of it for you. This will ensure that your fall and spring cleanups happen and that the potential for damage is minimized. At CJS Lawn & Landscaping we have well over three decades of experience taking care of this type of work. We know what goes into creating a stunning and healthy Kenosha landscaping and much of that is maintenance and upkeep. Why invest time and money into having the perfect yard only to have it destroyed by threats like mold, disease or pests. Contact us today so we can take care of your Kenosha seasonal yard cleanups and all your other lawn care related service needs. If you are looking for professional yard cleanup services in Kenosha, then please call 262-878-1660 or complete our online request form.